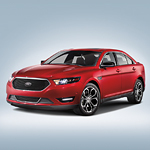 The Ford Taurus also comes with a stylish SHO grille made up of a black mesh center that is bordered by sleek chrome. Gene Langley Ford Inc will be happy to explain the different wheel options you have. You can choose between different sizes, finishes, and colors so that the vehicle perfectly suits your needs. You'll love all of the small design features that are incorporated.